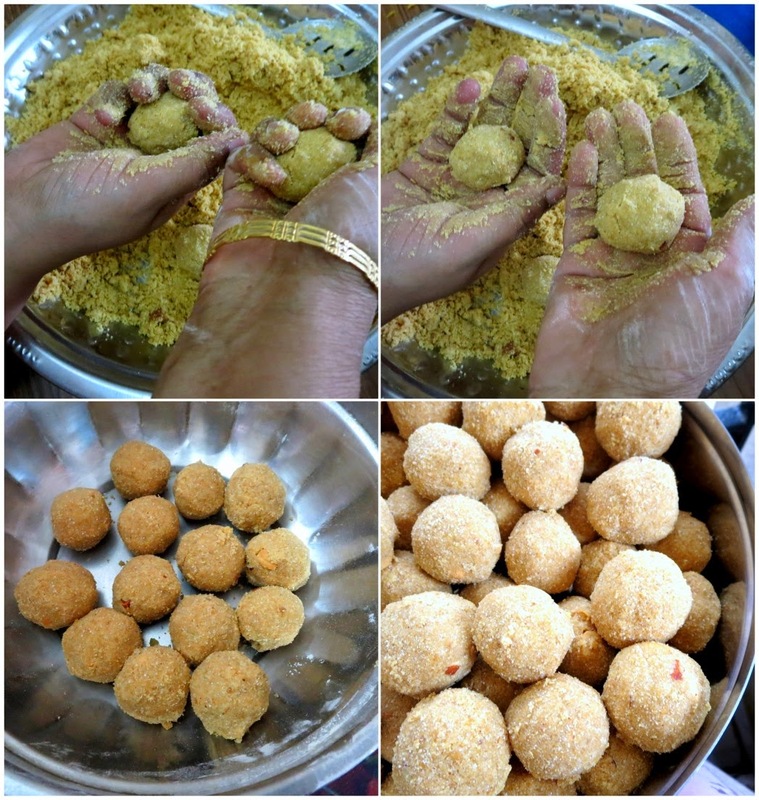 Learn how to make Minapa Sunnundalu or Urad Dal Ladoo, famous Andhra Dish, a different version from what I have already shared. 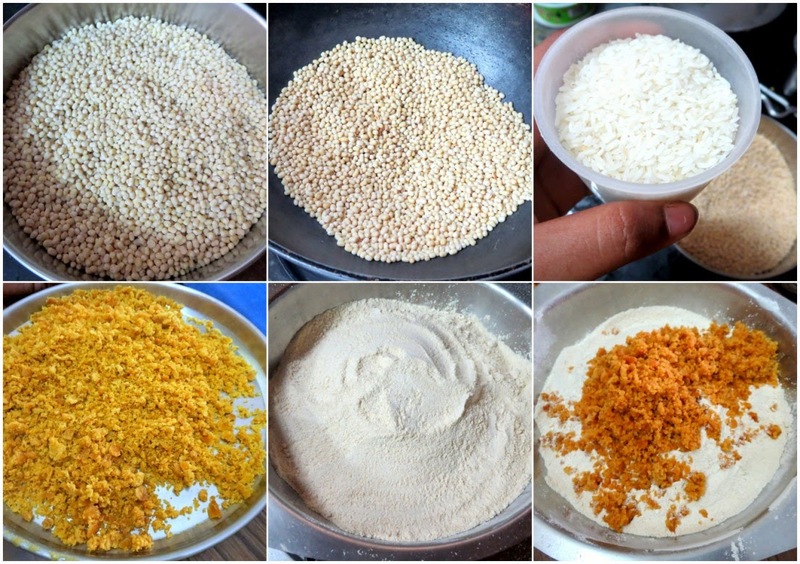 The first version of Sunnundalu was with just Urad dal and Jaggary. There is also one made with sugar. 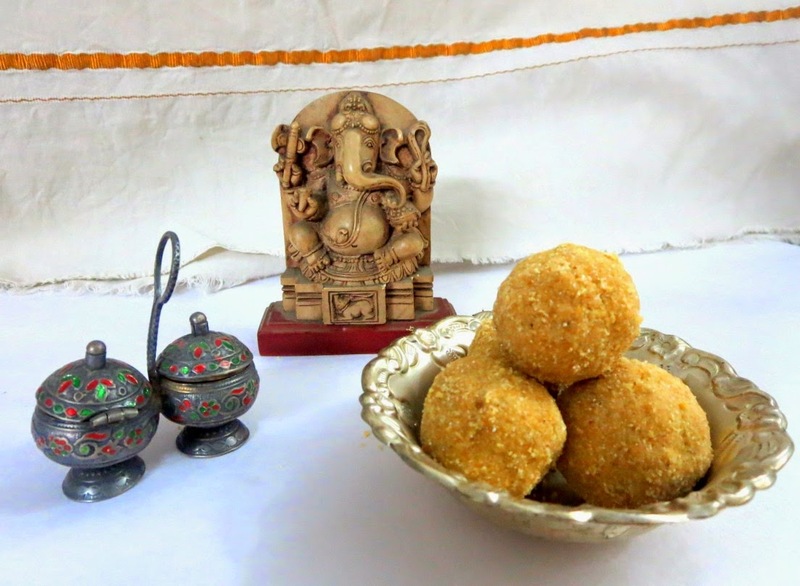 We are starting our fourth and final week of BM#42 and I am doing Festival Dishes, featuring Vinayaka Chaturthi Special Dishes. Though I am not very religious, growing up I have been exposed to our many festivals and have been following the rituals for Amma's sake. Ganesh Chaturthi is one such festival we follow with great pomp and show. Infact Amma follows all the different Indian festivals with equal zeal and diligence. She has a specific list of dishes she makes for each of them. Whereas Athamma follows only a specific list and that has made life quite easy for me. 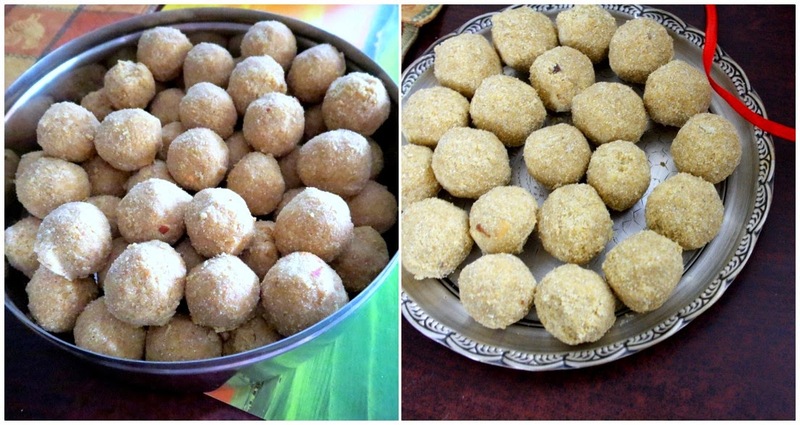 Like Holige or Sweet Poli, Amma used to make only for Ugadi, whereas in hubby dear's place, this sweet is done on all festivals. And apart from this, nothing much is specific. 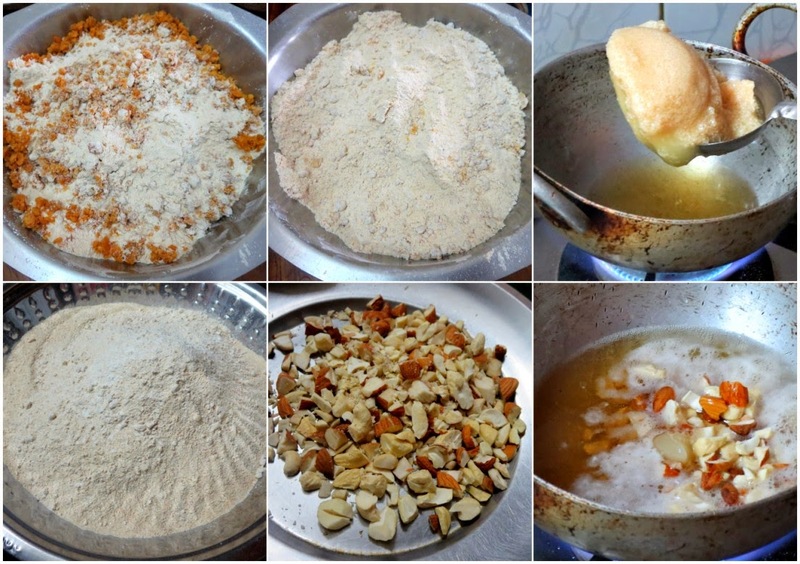 So Athamma makes poli for Ganesh Chaturthi. Depending on my own schedule and various levels of interest, I follow whichever is easy for me to manage! However since Ganesh Chaturthi is hubby dear's favourite pooja, I make sure I make it elaborate for him. We also have the Ganesh Pooja for three or five days. Making Neivedyam and doing pooja on all days, both time a must during the day God's Idol is kept home. I have been following my own tradition of making a special Neivedyam for Lord, when I do the pooja and those prasadams tend to be leaning towards easy and quick ones. I even had Ganesh Chaturthi Special for ICC special. If you are interested to see how we have been doing over the years at home, check out the below posts. I would have talked about what exactly happens from the morning of the pooja, how we do the shopping and the scene in our Market place. This post talks about how the celebration happens on the Market street. So for this season, I decided I would plan ahead with the neivedyams and planned on this Sunnundalu, a famous Andhra Laddo. Today's version is made with Urad dal, and Jaggary. It is different as we have included rice and roasted nuts as well. It surely gives a nutty taste to the laddos. I was sending this across to my colleague's daughter, so we made a huge batch and had got about 65 laddos with the measurement used today. As I was busy helping Amma make this, Konda took the step by step and she managed to capture us in different avatar making this. You can se us both making the balls in the below picture. The roasting has to be even so as to ensure the urad dal is golden in colour. Also since we are going to use the jaggary as grated form, you will have to make sure you get a variety that's dust free. Dry roast the raw rice separately till slight golden, remove and cool. Then dry roast the urad dal, stirring always making sure the dal is evenly roasted and is golden in colour. Cool both rice and dal. First grind the rice to a fine powder, then grind the dal till you get a nice powder. Grate the jaggary and then measure out the required amount. Now add the jaggary to the urad dal, rice powder and pulse it couple of times. You will get a mixture that will bind sort. 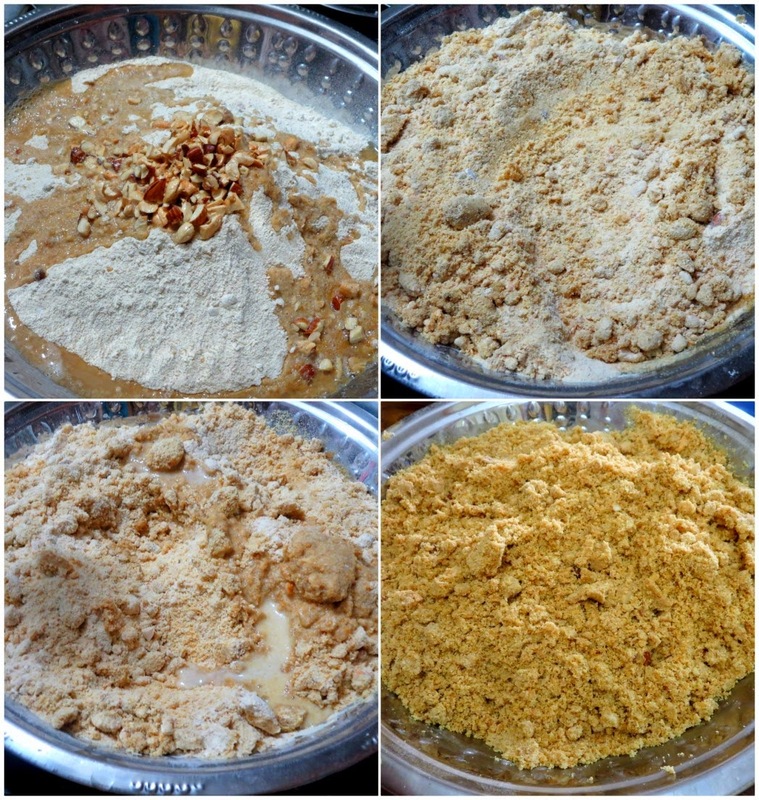 Heat the ghee, roast chopped nuts till golden, add the nuts to the dal powder, start mixing around. 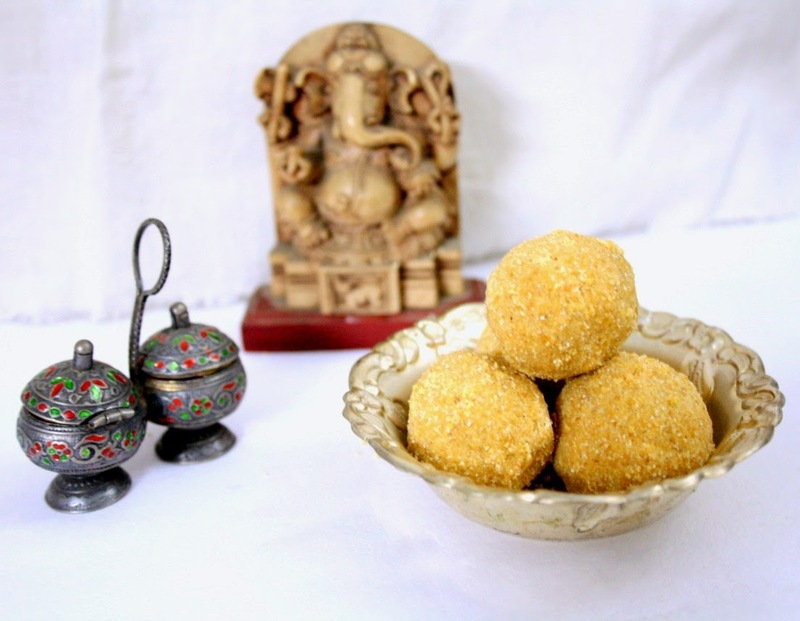 As you continue adding the ghee and mixing around, you will find that you will be able to retain the ladoo shape. Tightly close the balls in your palm to make the laddos and lay on a plate for them to get dried up. 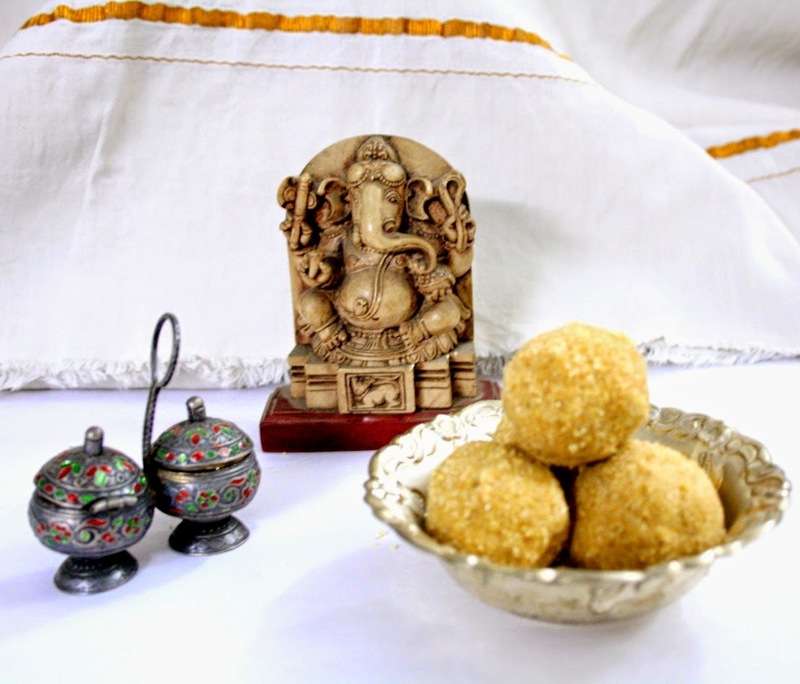 Since this is mostly made as a prasad during festivals, we never taste it before offering to God. However on a general scale, 1 : 3/4 jaggary should work best. Sometimes we make few laddos, offer to God and then adjust the sweetness if required. The dal powder can be made ahead as well and then you can make laddos as and when you want it fresh. These Laddos stay fresh for over a week or 10 days depending on how well you store it. Store in an air tight box.